Michelle Obama’s anti-obesity group is claiming Americans "clearly support" the First Lady’s healthy school lunch rules, despite a barrage of negative complaints about the standards on social media. "Let’s Move" attempted to get ahead of negative press about the lunches with the start of the school year, by posting a poll that claims 86 percent of Americans support the first lady’s healthy rules. But when schools began to reopen across the country over the past week, students resumed posting photos of unappetizing fare and meager portions in the lunchroom, with the hashtag #ThanksMichelleObama. "As the school bells begin to ring welcoming in the next school year, the W.K. Kellogg Foundation released a new national survey demonstrating that Americans clearly support keeping school meals healthy," Let’s Move said. "[T]he American public has noticed and appreciated the healthier school meal standards as the survey shows that 67 percent say the nutritional quality of food in their local schools is excellent or good, which is up from only 26 percent in 2010 before the standards were put into place," they said. The 86 percent figure came from a question that asked in general terms whether fruits and vegetables should be served in school. 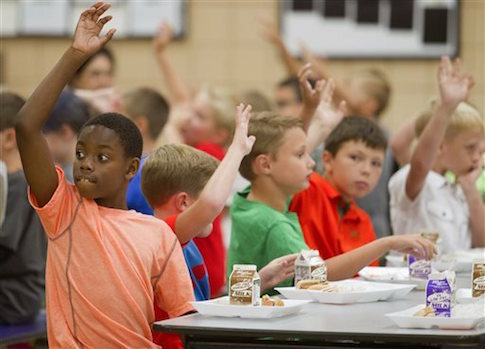 "As you may know, there are requirements such as providing fruits and vegetables and whole grain-rich foods that all meals served in public school cafeterias have to meet," the survey read. "Do you think these requirements should be strengthened, kept the same, or lowered?" Another question contributing to the survey’s favorable view of Mrs. Obama’s rules asked: "Would you say it is very important, somewhat important, not too important, or not at all important to serve nutritious foods in schools to support children’s health and ensure they are ready to learn and be successful?" Another question was phrased as "millions of kids are getting more of the fruits, vegetables, and whole grains they need to be healthy" because of the rules. "After hearing this, do you strongly support, somewhat support, somewhat oppose, or strongly oppose these new nutritional requirements?" the survey asked. Fifty-eight percent then said that they strongly support the standards. Meanwhile, nearly half of the respondents (47 percent) said the food served in school cafeterias has little to do with childhood obesity. Other findings from the survey found that nine out of 10 Americans said "nutrition standards in school meals are important," and 91 percent said kids need access to safe drinking water in schools. The survey was based on responses from 1,206 adults. Only 15 percent said they knew a "great deal" about the new requirements, while 41 percent said they knew some, 28 percent said "not too much," and 11 percent said they knew nothing at all. Forty percent of respondents were Democrats, compared to 34 percent Republicans, and 7 percent of independents who lean Democrat. The poll was conducted by the W.K. Kellogg Foundation, which donated $5,000 to President Obama’s reelection campaign in 2012. The survey results stand in stark contrast to the complaints of students and school officials, who say students are avoiding cafeteria food as a result of the rules. A recent survey by the Student Nutritional Association, which supports healthy requirements for school lunches but seeks greater flexibility with government-mandated standards, found that participation in the school lunch program is down, food waste is up, and 80 percent of school districts have taken steps to offset financial losses as a result of Mrs. Obama’s Healthy Hunger-Free Kids Act. This entry was posted in Issues and tagged Let's Move, Michelle Obama. Bookmark the permalink.